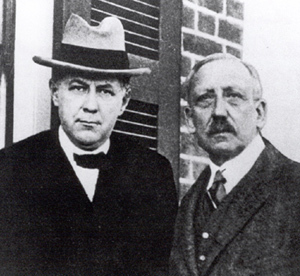 J. Fred Johnson, on left, with John B. Dennis. Appalachian entrepreneur and promoter of the model city of Kingsport, J. Fred Johnson was born on June 25, 1874, in Hillsville, Virginia, the son of J. Lee Johnson and Mary Pierce Early Johnson. A nineteenth-century American value system heavily imbued with the Protestant work ethic shaped his private life, and New South philosophy and progressive ideals influenced his public career. From 1916 to 1944 he devoted himself to the promotion of the planned industrial city of Kingsport. His life provides an example of a native Appalachian entrepreneur allied with northern investors to promote economic development in the Upper South. Johnson’s father died when the boy was a teenager, and he dropped out of school to rescue his father’s general store and support his mother and two sisters. He managed to pay his father’s debts with interest and continued his education by reciting his lessons to an old schoolmaster and later reading law. His marriage to Ruth Carter led directly to his business association with her brother, George L. Carter, the principal promoter of the Carolina, Clinchfield and Ohio Railway (CC&O). When Carter encountered financial difficulties, John B. Dennis of Blair and Company, New York, salvaged the project. In 1916 Dennis persuaded Johnson, who heretofore had been involved in optioning land for the railroad and in managing commissaries along the construction route, to assist him with the development of the CC&O’s model city of Kingsport. Under the auspices of the Kingsport Improvement Corporation, Dennis envisioned, financed, and directed the establishment of the new town, and Johnson provided the practicality to make the plan possible. When Johnson died on October 4, 1944, having spent almost thirty years as a one-man chamber of commerce, Kingsport stood as a monument to him. Affectionately known among residents as “the Father of Kingsport,” Johnson had contributed to the successful establishment of a diversified industrial town and an urban culture in Appalachia dominated by a middle-class American value system.